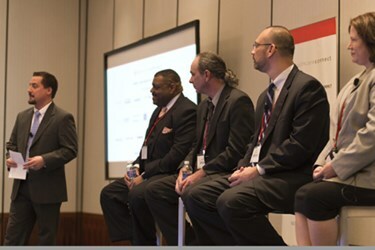 The panel at The Smart VAR Healthcare Summit on May 6 in New Brunswick, NJ, helped take the guesswork out of selling IT to healthcare providers. Responding to questions from panel moderator, Mike Monocello, Business Solutions editor in chief, the panel listed the best ways to contact them, how to get and keep their attention, information that can get a second call or appointment — as well as what not to do if you want the sale. Mark Roberts, enterprise manager of mobile technology for Yale New Haven Health System, says one of the best ways to contact him is reaching out through social media, specifically LinkedIn. He says this is particularly effective if the VAR has done research into his healthcare organization, its needs, and how their solution could address them. According to Roberts, it is a mistake to have a third-party telemarketer make cold calls. He explains if he is interested in the solution, the caller — usually with limited technical knowledge — can't answer his questions. "I was engaged at that point and asking questions," he comments. "On the next call, I have to start all over again."